To steal a line from AMC’s Mad Men, “the day you sign a client is the day you start losing them.” The same sentiment could apply outside of the advertising world, to that of mobile applications and their users. The day you finally get that user download is the day you are no longer simply competing against other apps in the app store, but also every other thing your user spends their time on, both on and off their devices. We’re talking about sleep, showers, food, entertainment, etc. According to Localytics, this past year, 20% of downloaded apps were opened only once, and out of that 20% there is no published research to define how many were removed from the device or replaced. Because, yes, with over 1.2 million apps available for iOS alone- there is indeed an app for that, and often times, several. So, while it can be easy to focus on the satisfaction of a high number of downloads under your belt, the excitement may be short-lived without follow up, as it’s necessary to earn your keep- by keeping your user engaged. When measuring the success of user engagement, total time spent in app, session lengths, uninstalls, downloads, session intervals, and the number of app opens, are just a few items to review. Google Analytics Behavior Reports can go as deep as to display not only the length of sessions, but total number of screens interacted with by the user, and in what order. There is an array of strategies that can be implemented to use this information to increase engagement. Yet, even while push slows the activity decay rate, these notifications do not completely solve the issue at hand. As you can see, after four months, retention is still down nearly half from month one. 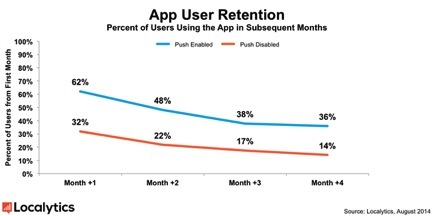 While push assists in drawing user attention back to the app, keeping them satisfied once they are there will also increase the likelihood of continued return. Frequent App launches (updates) can motivate a user to re-open and interact with an app, to see the changes for themselves. It can also address issues within the app that may have been driving the user away initially. Crashlytics can be integrated into an app for issue reporting and highlighting areas that can be improved. If the functionality of an application isn’t working for a user, what reason do they have for recurrent use? Continuous application enhancement demonstrates that there is a commitment to the customer and reason to return. These are just two approaches that can be employed to increase user engagement. By expanding the focus outside of the number of app downloads and better understanding the current user, there are a number of strategies supporting improved retention.